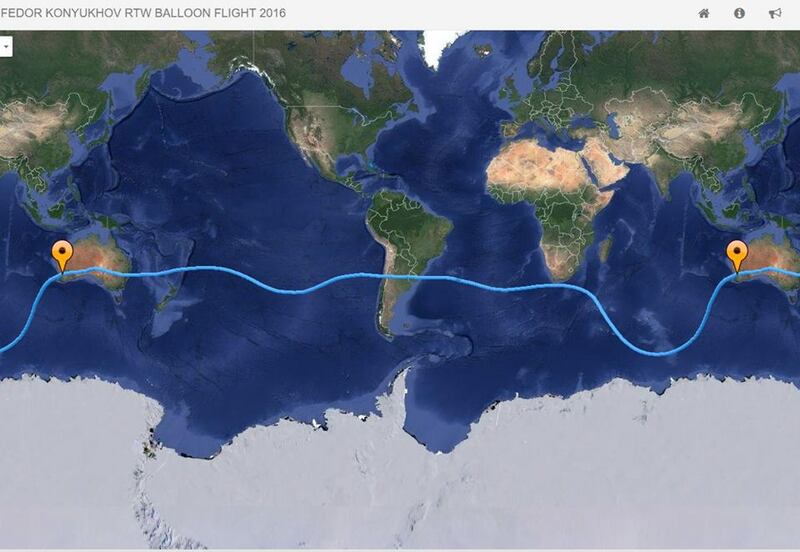 Russian adventurer Fedor Konyukhov has broken the record for the fastest circumnavigation of the Earth in a rozier balloon in just over 11 days. Konyukhov, who set off from Western Australia’s Avon Valley on July 12, has gone past the point he needed to fly over to break the record and is expected to land in WA’s Wheatbelt later this afternoon. This entry was posted in first, Gasballoon, Guinness, Records and tagged Fedor Konyukhov, track on July 23, 2016 by phz. 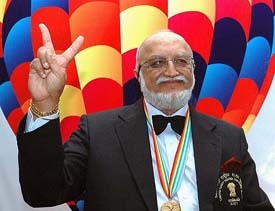 The record by Vijaypat Singhania is subject to verification, but his son Gautam Singhania said the 44-ton balloon climbed nearly 70,000 feet, beating the old mark of just under 65,000 feet. “This goes to show to the world that we are not bullock cart drivers, but we can compete against the best of the world,” the balloonist said. One of the balloon’s designers said the height will be determined by instruments sealed inside the capsule. Once verified by aeronautical groups, the findings will be submitted to Guinness World Records. The 67-year-old balloonist landed safely after a nearly five-hour flight inside a pressurized cabin suspended from the 160-foot-high, multicolored balloon. The flight was carried live on Indian national television. “The exact height reached was 69,852 feet. 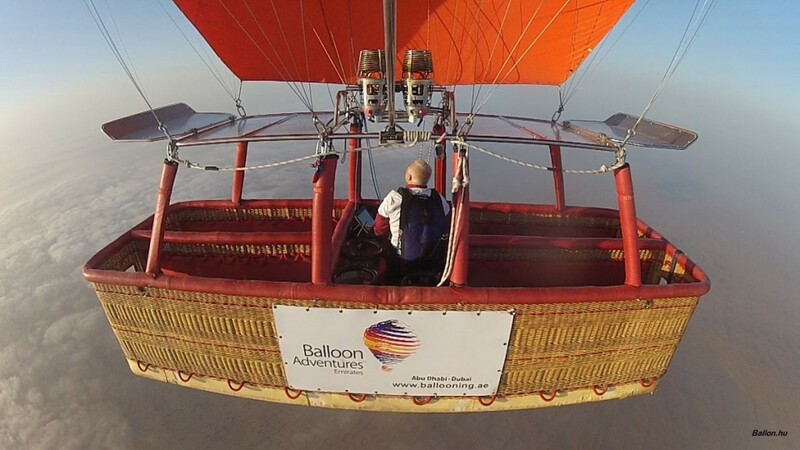 This is subject to certification,” said Colin Prescott, one of two British designers of the balloon. The previous world record was 64,997 feet, set by Sweden’s Per Lindstrand in Plano, Texas, in June 1988. Hundreds of jubilant villagers crowded around the balloon to congratulate Singhania. “When I broke the record, I was euphoric. I screamed quite loudly,” he said. Singhania lifted off from downtown Bombay and landed safely on barren land near Panchale, a village about 150 miles south of Bombay. Singhania, the chairman emeritus of the Raymond Group, one of India’s leading textile companies, also set a record for ultralight aviation 17 years ago when he flew 6,000 miles from Britain to India in 23 days. This entry was posted in Calendar, Events, FAI, Guinness, History, Photos, Records, Video and tagged Singhania, Vijaypat on November 26, 2015 by phz. 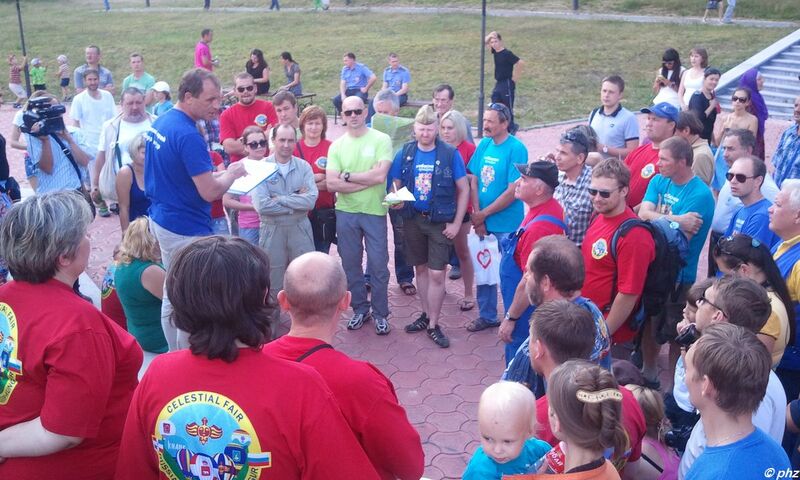 The participants of International Sport Competition of Hot Air Balloons “Sky Fair – 2013” – which was FAI Sporting Event – made a special flight after the contest program. 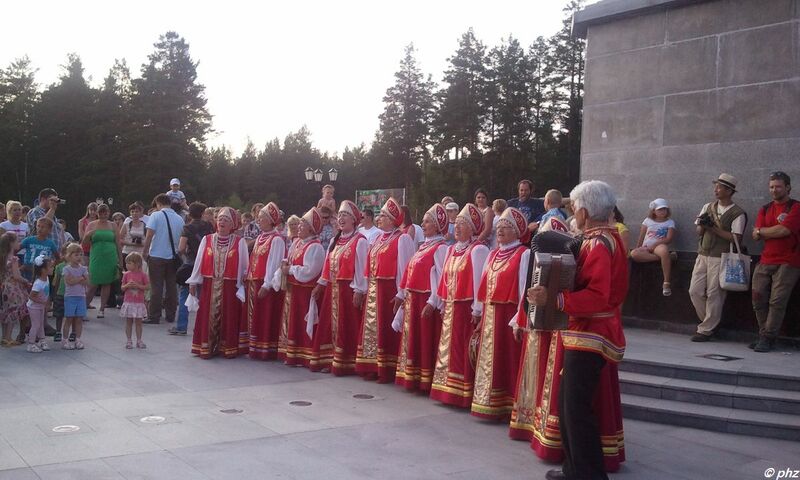 We travelled from Kungur (host city, Perm region) to near Pervouralsk (satellite city of Yekaterinburg) at evening 5th July 2013. There is monument with a huge column which shows the border of Europe and Asia (56.870553, 60.047951). 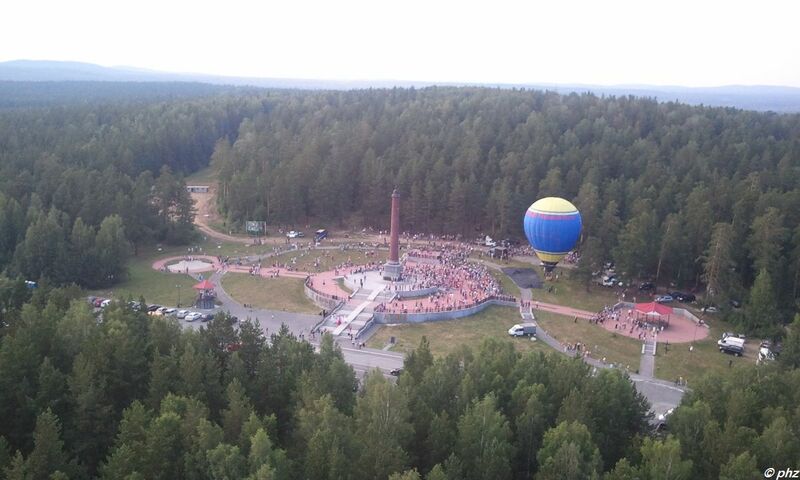 Twenty-two balloons are arrived to the meeting point. The distance is 250 km between Kungur and Pervouralsk which is not so much but the journey was hard because the Russian bus and roads. We had a good lunch and some rest. The organisers provided a nice folklore show too. Some balloons are prepared to take-off close to the monument and the rests are moved to a nearby glade after the briefing in the Asian side. We didn’t plan long flight because huge forests, big lakes and few glades were in the flying area. The destination was only crossing the border of the two continents which was successful. We recorded and scored the flights with same tools as the competition flights. 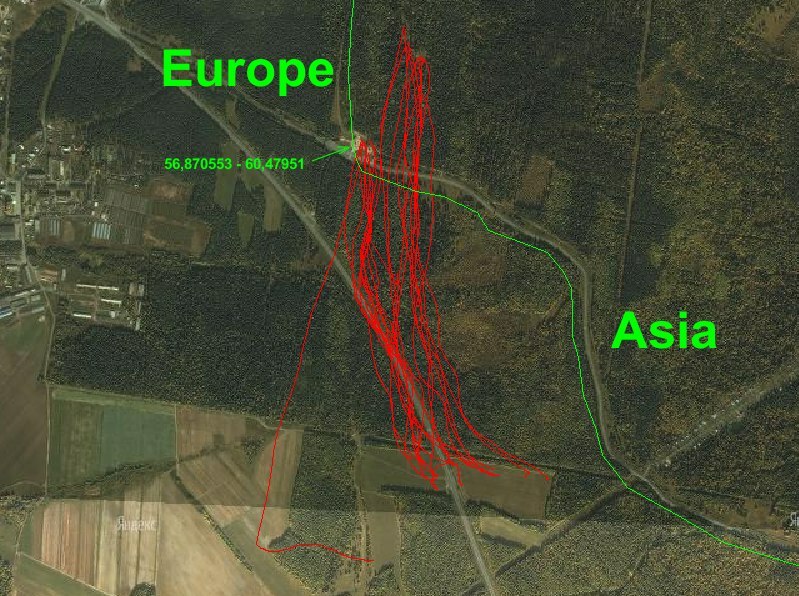 The officials of the FAI Sporting Event checked the tracks of GPS loggers after the flights. One pilot turned on the GPS logger during the flight. We can’t record his take-off position but that was the first documented Event were many hot air balloons flight over the Europe – Asia border. The organiser will apply for the approval of Guinness Record. The green line is the border of Europe and Asia. The tracks of the balloons are red. Asia Europe flight. We started at first and we flew southernmost. Mor photos from the Event are here, here, here and here. This entry was posted in Events, first, Guinness, Kungur, News, over, Photos, Records and tagged 2013, Event, FAI, Kungur, map, News, Photo, Records on July 11, 2013 by phz. 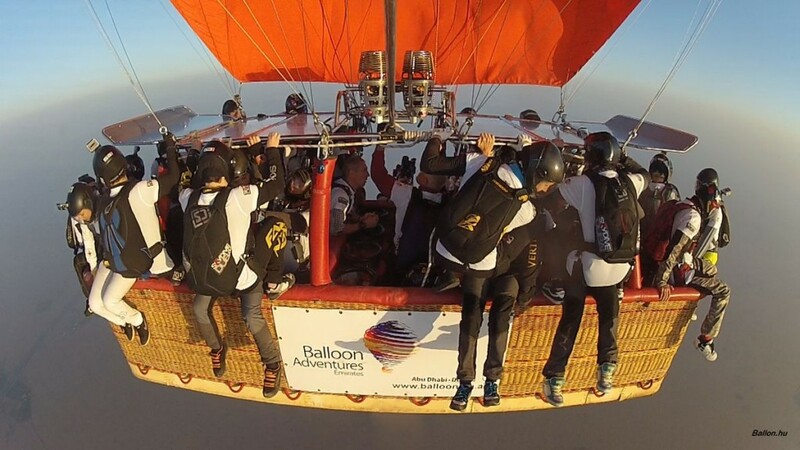 Balloon Adventures UAE in collaboration with Skydive Dubai officially broke two of the Guinness World Records. 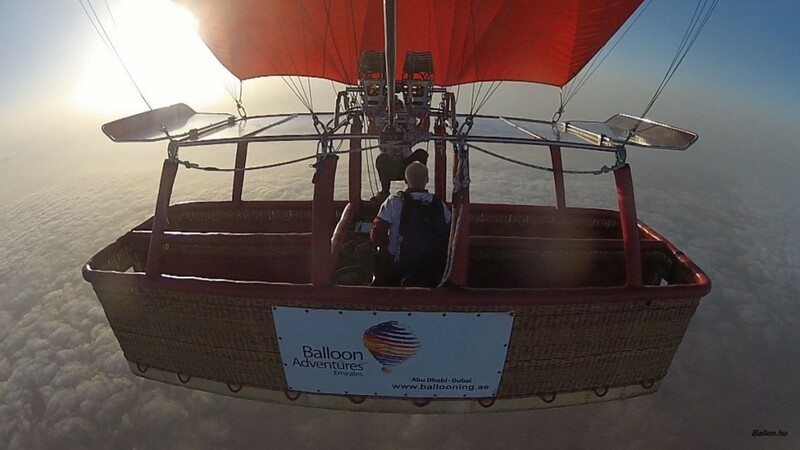 The first record broken was for the most skydivers to parachute from a balloon during the same flight is 40, achieved by Skydive Dubai, on the 10th of February 2013. 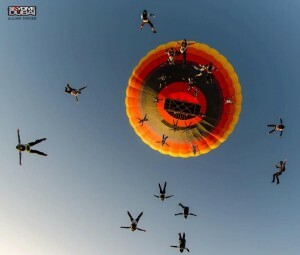 The second record broken was for the most skydivers to parachute from a balloon simultaneously is 25, also achieved by Skydive Dubai, at the same day. 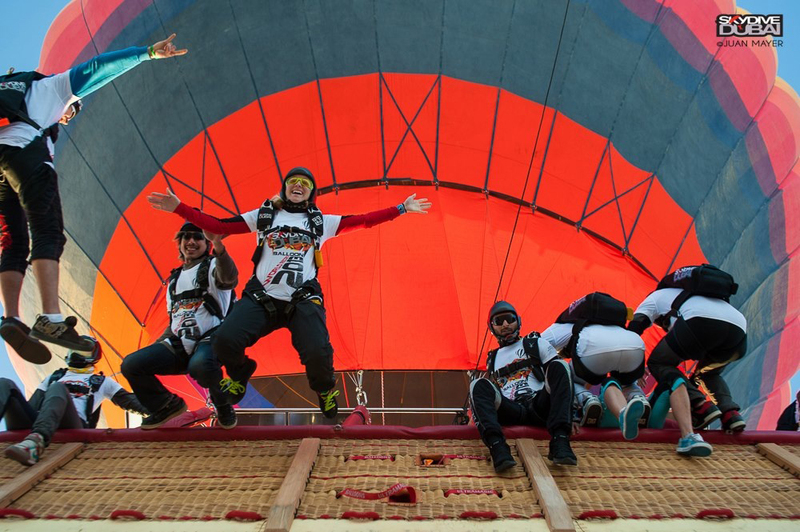 “We had no idea what will happen on the balloon, the balloon may be distorted, it may rock, we had no idea when the balloon will stabilize” said Raul Bocanegra, Skydive Dubai Desert Campus Manager. 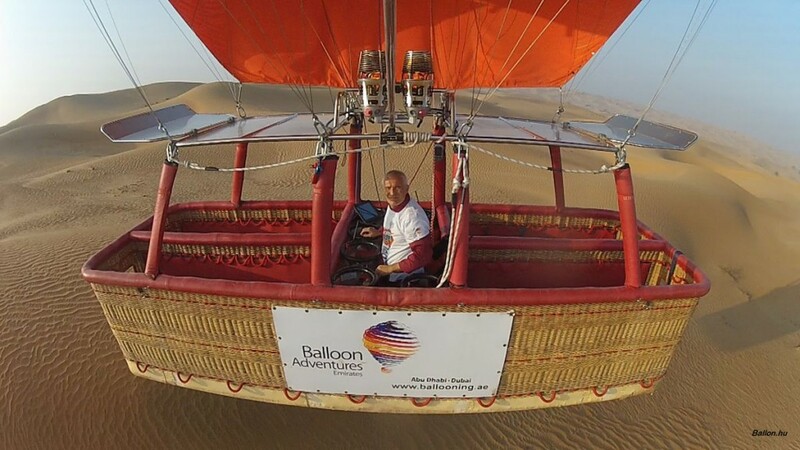 The idea came to life when Mike Howard afrom Skydive Dubai suggested joining forces with Balloon Adventures UAE and use one of their big hot air balloons. 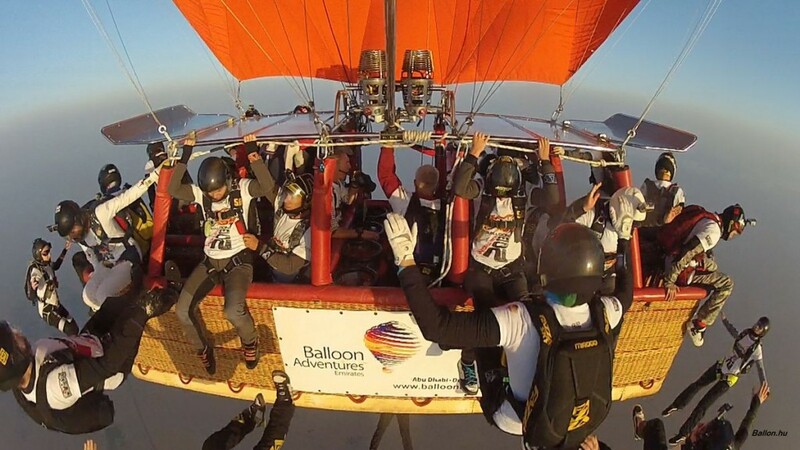 “It took us two weeks planning and preparing all the scenarios that might happen and our reaction to it, we needed the weather to be perfect to proceed,” explained Mike Howard Skydive Dubai Air Balloon Pilot. The event took place in The Skydive Dubai Desert Campus Drop Zone, located in Mergam, 35 km away from Dubai city. One of the main problems that was faced was trying to find the skydivers when they landed, since there were 40 skydivers jumping they all had to land in different places to avoid any accidents. 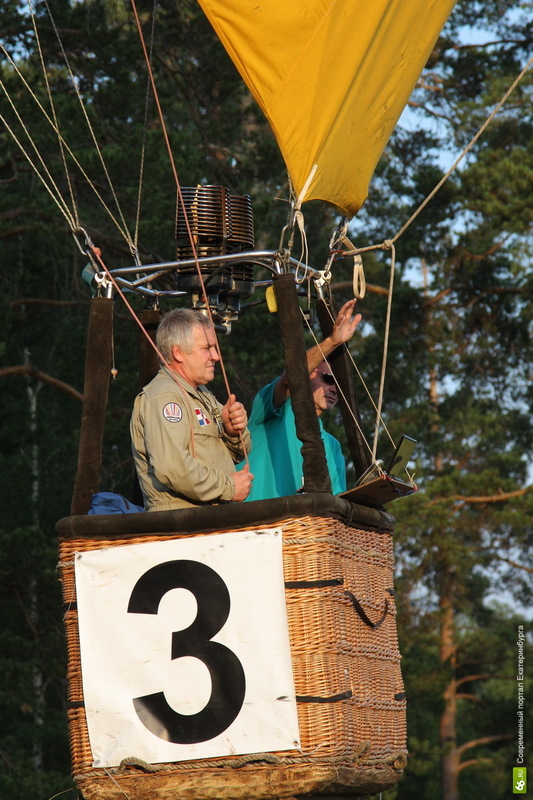 The Balloon Adventures pilot Peter Kollar (HUN) who was the main pilot of the balloon was also trained on parachute emergency and safety procedures for extra precautions. “All records are meant to be broken” stated Bocanegra. All in all the whole process went well, two major world records were officially broken and the event proved to be an ultimate success. This entry was posted in Guinness, Photos, Records, Skydive, Video and tagged Dubai, Guiness, jump, News, Records, Skydive, Video on March 10, 2013 by phz.